After completing a summer in Washington D.C. with the Rowny-Paderewski Scholarship, Aneta decided to earn her Master‘s Degree in Public Policy at Georgetown University with a Fulbright Graduate Award. Before moving to the United States, Aneta received an MA in International Relations at the University of Warsaw. She is fluent in English, Spanish and German. She has channeled her entrepreneurial spirit and passion for international development into work with institutions such as the European Commission and the Institute of International Education. Currently, as a Graduate Fellow at the Qatar Foundation International, she contributes to the Foundation’s evaluation program. She currently is learning Arabic. A strong advocate for education and democracy, Aneta is involved in expanding the Rowny-Paderewski Scholarship and promoting the heritage of Ignacy Jan Paderewski. She also maintains strong ties with the Polish community in the United States. 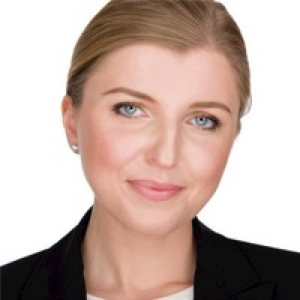 She is involved in Quo Vadis - the Young Polonia Leaders Conference and the American Polish Advisory Council (APAC). Her interests include International Economic & Social Development, Democratization, Social Accountability and Foreign Assistance. She enjoys travelling, sports, dancing and cooking.